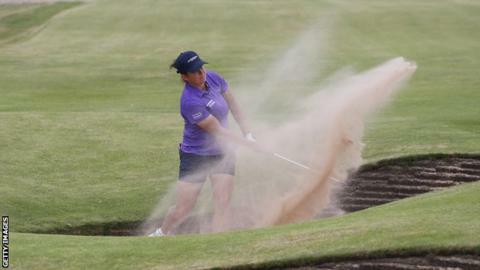 Scotland's Michele Thomson is five shots off the lead in joint fifth after round one of the Women's New South Wales Open, near Canberra. The Aberdonian's three-under 68 leaves her trailing Iceland's Valdis Thora Jonsdottir, who scored a career-best 63 despite playing with a bad back. France's Astrid Vayson de Pradenne is in second, three behind Jonsdottir. England's Felicity Johnson and Scotland's Carly Booth are in a five-way tie for seventh on two under. Defending champion Meghan MacLaren a shot further back following a 70. "My back has been hurting a lot the last five weeks, so I decided this week I am going to try and swing it quite slow," said Jonsdottir, who was barely able to sit up in bed last week. "I kept the ball in play, I hit a lot of good iron shots into the greens and made a lot of good putts."